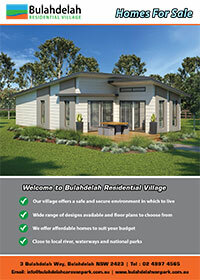 Bulahdelah Residential Village is located at 3 Bulahdelah Way Bulahdelah. Prior to the opening of the Bulahdelah bypass the street address was known as 9787 Pacific Highway Bulahdelah and some electronic navigation systems still show that address. Bulahdelah Residential Park has a number of excellent sites available for your choice of a Hi-Tech home to own and occupy.